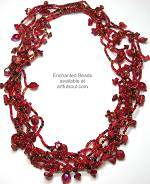 On this page we gather RED jewelry and handbags! Year-round, the use of red is a classic accessory color, whether it is matching your red suit or offering a splashy contrast! 1-7/8 inches long on goldfill earwire, 3/4 inch across. A trio of graduated oval loops are colored brick red, tomato red and copper with sparkling and matte texture mix. 2 inches long on sterling earwire, 7/8 inch across. A pair of balloon-shaped cutouts are joined at top and bottom, colored in satin rose red, with pink glass bead dangling underneath. Earrings are 1-1/2 x 1 inches, surgical post located 3/8 inch below top edge. Pendant measures 1-7/8 inches, tied onto red satin cord at 27 inches long (no clasp). Pendant measures 1-1/2 inches, suspended from 17 inch red satin cord, spring ring clasp. Pin measures 1-1/2 x 1-3/4 inches, has short barpin clasp to wear at angle shown. 2-1/4 x 1-1/4 inches, easy size to wear and light in weight, this pin has colorful beads arranged to depict a red lobster. Velveteen on the back. Elegant shiny bright red patent leather wallet has shiny golden hardware along flap edge. Measures 7-1/2 x 4 inches. Closes with 2 magnetic snaps without effort. Interior is lined in metallic gold leather (or could be nice faux). Has center section with bill slot and 6 card slots. At end is a gusseted large pocket, that has attached a checkbook slot and zipper coin purse, ID window and 4 more card slots. 1-1/2 inches long on goldfill earwire, an oval disk in the background is 1/2 inch across and colored red. Cutout brass leaf motif tops this, with red crystal dangle below. 1-7/8 inches long, 3/4 inch across, on silver plated french earwires. Constructed of brass and/or aluminum that is plated. 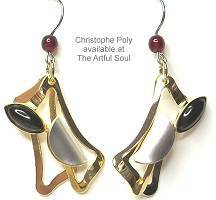 A pair of freely swinging abstract shapes in shiny gold finish are accented with red cats-eye cabochon and folded satin silver circle. 1-5/8 inches long, 1 inches across including natural twig. Handmade paper with calligraphy design hovers above background of marbled red, golden bead rivets in the corners. Golden straps hold a twig and dangling beads below. These are CLIP On style for all ears and super lightweight! Joanie M earrings, 1-3/4 inches long on silverplated earwires, 9/16 inch across. The almond-shaped fused glass element has raised dot at the center for dimensional interest, the colors work inward from tomato red to gold and golden brown. Joanie M earrings, 3/8 inch squares with surgical post in back. The fused glass colors work across from tomato red to golden brown. Joanie M necklace features a 2 inch fused glass square with u-shaped cutout, it also features 2 bubbles for extra interest. Suspended from dark brown leather hanger on woven brown cord. 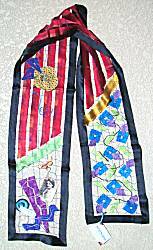 Wrapped sliding clasp, NO METAL, that you slide open to pull over head, pull cord ends to tighten for desired length (18-28 inches). Glass colors work from tomato red into gold and golden brown. 1-3/4 inches long including silverplated earwire, about 3/4 inch wide. Tiny glass seed beads in rings with single larger crystal and nugget bead, are suspended on another ring of beads to form a graceful cluster of color. Tomato and cherry reds. 7-3/8 inches long, about 1-1/4 inch wide with all the beads jutting forth from the peyote woven seed bead band underneath. Flexible and as comfortable as a ribbon draping around the wrist, the magnetic clasp is completely hidden by beads, easy on and off. Tomato and cherry red with dots of black and bronze, coral and shell. A single polymer clay ellyptical bead 1-7/8 inches long, is suspended from 3 slender strands of coordinated color wire. The bead colors are red, purple and offwhite. Goldfill beads on each side, silver tension clasp for the necklace, 17 inches long when closed. The polymer clay ellyptical beads are about 1-1/2 inches long, suspended from self-locking goldfill earwire to dangle 2-1/8 inches. The colors are rose red with purple and coppery gold. Orbicular patterns are revealed in translucent and opaque, rubbed to satin finish.